A not so long time ago, Jason & Gabe had the great idea of watching the Ben Burtt penned Droids animated series primetime special, The Great Heep. Having loved it and talked about Master Mungo Baobab in just about every Blast Points episode afterwards, they decicded that it would be awesome to go ahead here and do a full commentary for the entire Baobab arc of four Droids animated episodes. Almost ninety minutes later, they are wondering if they made the right decision. Join them this week as they struggle to know what's going on, figure out just who is talking, how this all makes any sense, do bug man voices and struggle to not drift into the forever sleep. It's the Treasure of the Hidden Planet and it's definitely one of Star Wars' strangest moments ever. So ride your space horse to the Rune Sea and get Lin-D the comedy droid out & try to to celebrate the love with Blast Points! watch it here : https://youtu.be/tSvZZwlbnKs Blast Points t-shirts are now available! Get them here: www.etsy.com/shop/Gibnerd?section_id=21195481 visit the Blast Points website! www.blastpointspodcast.com reviews! comics! recipes, articles and tons more! if you dug the show please leave BLAST POINTS a review on iTunes and share the show with friends! If you leave an iTunes review, i will read it on a future episode! honestly! talk to Blast Points on twitter at @blast_points leave feedback, comments or ideas for shows! 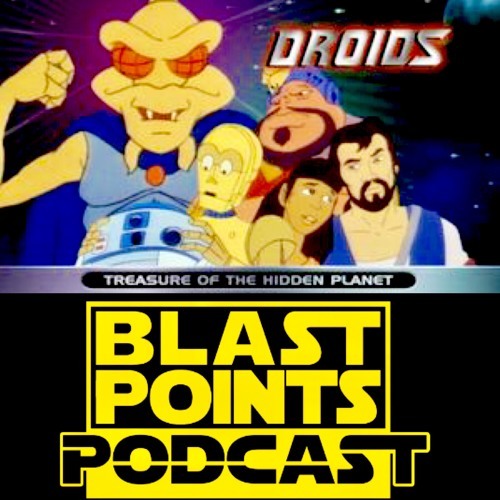 also like Blast Points on Facebook for news on upcoming shows and links to some of the stuff we talk about in the show!! we are also on Instagram! Wow! your hosts are Jason Gibner & Gabe Bott! contact Jason at Gibnerd@hotmail.com May the Force be with you, always. @user-569109249: totally random. so random we almost didn't make it. thanks as always for listening!!!! !